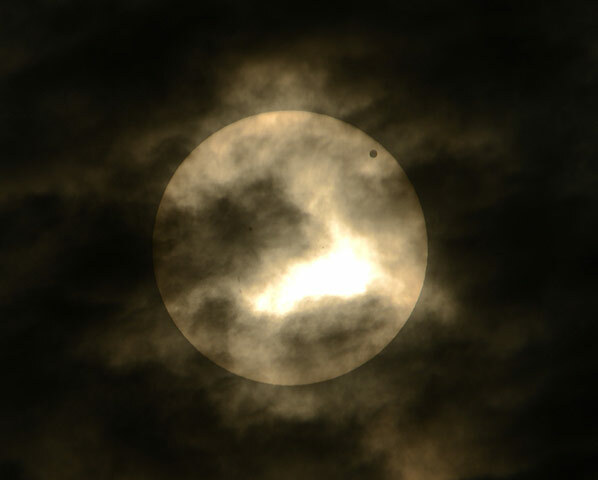 Yesterday was an astronomical occasion known as the Transit of Venus, which refers to the passage of the planet between the sun and Earth. The passage occurs infrequently (by human standards) and won’t happen again until 2117. You may already have seen images of the small black dot outlined against the larger golden disk of the sun–100s of them are available at Google Image and they will be featured in many slide shows today. But you’ve seen that before–and not just during the transit of 2004–but in thousands of decorative designs in advertisements, on clothing and accessories, and throughout popular culture. OK, the dot may not have been there, but smooth surfaces, solid colors, and abstract shapes were present, just as they are found throughout modern design. 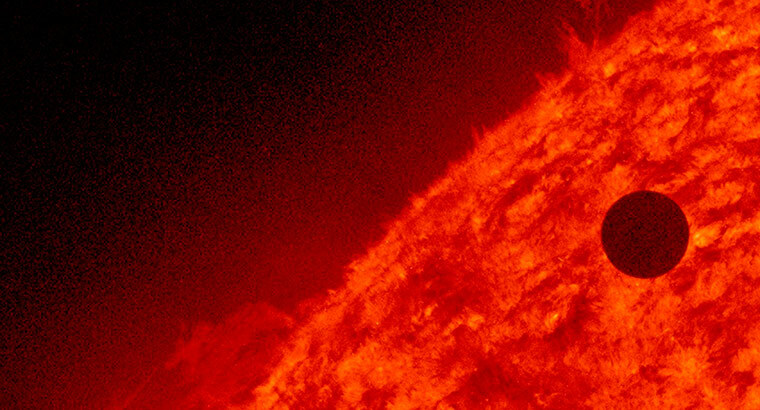 Thus, a stock image of this relatively unique celestial event is already crafted according to a standard way of seeing–that is, according to the optic of modern design. And in that optic, the world is already well under control and everything, including visual experience, has been made made manageable through processes of abstraction. Perhaps that is why I prefer this image of the transit, which inverts many of the features of the modernist representation. The sun appears to be the moon, and its power has been reduced further by the occluding clouds. Likewise, the position of Venus seems less a matter of decoration and somehow almost as substantial as the sun itself, perhaps because it is continuous with the darkness surrounding and partially covering the sun. The clean circular lines are the same, of course, but now they, too, are but cuts in the vast darkness rather than containers of light and movement. Most important, the mood is darker, almost elegiac: the image activates deep, rich emotions rather than sanitizing emotional response. If the sun and planet are still somewhat abstracted–we see but shapes at a distance–that formalism is complicated by how they are covered, almost shrouded, by the clouds. In place of timeless symmetries, we also see shifting atmospheric conditions. In place of a visual spectacle, we are reminded that we see as through a glass, darkly. We will never see the sun face to face, of course, but other images use other mirrors to get us close to its seething surface. 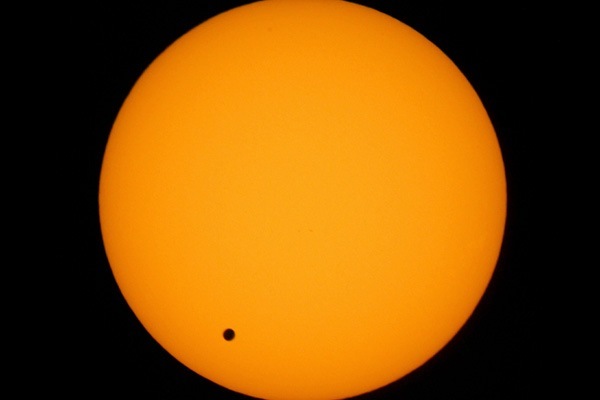 The image above is another shot of the transit, but now only the small planet is still a flat, uniform surface, while the enormous energies of the sun breach the surface of earlier abstractions. Now Venus is precarious again, but not merely because of a difference in size. As superheated gasses plume outward into space, Spaceship Venus becomes a vessel in constant peril. It’s fine to contemplate another planet orbiting the sun in tandem with our own circuit through space, but now one can begin to see that the universe is a dangerous place. Instead of formal unities, here you can begin to appreciate actual dangers. Were we a minute closer to the sun, we wouldn’t be enjoying the view. The last image is as crafted as the first, of course, but at least it is less familiar. Each image contains an optic, but in some cases the image may challenge complacency. The transit from optic to image is not from mediation to an authentic encounter or from a predetermined response to radical openness. Likewise, each image and each way of seeing is valuable and particularly so in one setting or another. But a transit is possible nonetheless, if only from an illusion of control to a sense of awe and gratitude. Photographs by Bobby Yip/Reuters (2004), Adalberto Roque/AFP-Getty Images, and NASA/Reuters.